An allergy is the body’s natural reaction to what it considered to be a foreign invader, which enters the body to attack it. The immune system triggers a counterattack to kill this foreign invader before it has a chance to damage the body. These foreign bodies can be anything from dust, pollen in the air, smoke, and even foods. The substances are not always harmful. For example, it can be food, but somehow the body interrupts these invaders from the outside called allergens to be that way. The body will release an antibody called histamine to combat the allergen. As a result, the allergy sufferer will experience different annoying allergy symptoms from quite innocuous, to moderate and severe. Not all people will have all the allergy symptoms and most people will have just the milder ones. To truly appreciate the range of symptoms it would be helpful to know the types of allergies that are causing them. There are many types of allergies, such as hay fever, hives, poison ivy and plant allergies, bee sting allergies, pet allergies, latex allergies, eczema, perfume and cosmetic allergies, aspirin allergies, drug allergies, eye allergies, food allergies, wheat allergy, milk allergy, nut allergies, fish allergies, shellfish allergies, soy allergy, sun allergy, and seasonal allergies, such as spring and fall. Common allergy symptoms across the board. The most common allergy symptoms are: sneezing, trouble breathing, stuffy noses, itchy runny eyes and nose, congestion and a rash, but there are different allergy symptoms which go along with different kinds of allergies as well. Normally the mild symptoms will only appear in the area of the body where the allergy has targeted. For example a sting will be felt and swelling will appear at the site of the sting. When the allergy has reached the moderate stage, the swelling can encompass a larger area, such the entire arm or leg. Moderate symptoms can include swelling, itchiness and difficulty breathing. While most of these symptoms will be common across the board, what is not common and life threatening is called anaphylaxis. Anaphylaxis occurs when the body produces a specific antibody to protect against an allergen. This antibody is called immunoglobulim E or IgE. The body will produce IgE the first time it comes in contact with the substance (allergen), but it does not react at the time. However, if the substance is reintroduced at a later date, the antibody will activate and it will produce the protein called histamine. It is presence of histamine that causes the allergic reactions. Unlike milder forms of allergies, which might take some time to develop, in this severe form of allergy, the body reactions immediately and symptoms will be felt in all parts of the body. You need to watch carefully for certain allergy symptoms. The symptoms can start with itchy eyes or face and quickly progress to the following: swelling in different parts of the body, difficulty in swallowing and breathing, abdominal pain, cramps, diarrhea, hives, vomiting and confusion, disorientation or dizziness. 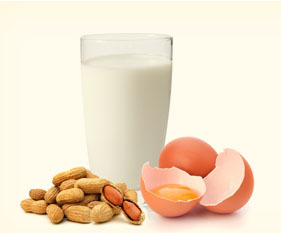 Foods such as nuts and shellfish, dairy products, egg whites, sesame seeds, and shellfish can trigger anaphylaxis. Bee and wasp stings can also trigger anaphylaxis. Fish, penicillin, and latex can cause an anaphylactic reaction, only the antibody IgE is not produced in these cases. A person experiencing anaphylaxis must get to the hospital emergency room immediately. There is no time to wait for a personal physician. During an anaphylactic episode, the person can have extreme low blood pressure and dilated blood vessels, and an accelerated heart beat which can lead to what is called anaphylactic shock. If anaphylactic shock is not treated immediately the person may fall unconscious and could die. At the emergency center the person will be given epinephrine by injection, usually given in the thigh. Intravenous fluids and medicines may also be administered to stabilize the heart and circulatory system. Once the person is stabilized, antihistamines and steroids may be given to relieve the allergy symptoms.